Easy and less costly to maintain and service. Superior quality - manufactured to exacting standards under ISO-9002. Tested to ANSI/ UL standards. Easy to refill and charge using air compressor. Note: Fire extinguisher ships EMPTY (extinguisher only) An authorized service center will need to pressurize the extinguisher for you or follow the recharging instructions. See Specifications tab for more info. Use For Fire Fighting Class "A" fires ONLY or Class "AB" when charged with FireAde 2000. UPS Ground Shipping Included - Anywhere in the continental US. Use For Fire Fighting Class "A" Fires. Class B Fires: Only when charged with FireAde 2000. Makes a great flammable liquid spill control applicator. Just spray flammable liquid spill with FireAde 2000 mixture to render fuel non-flammable! 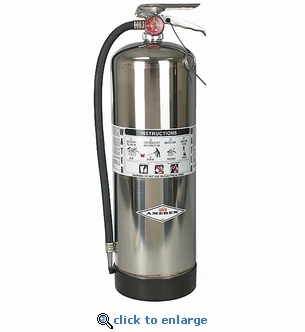 Amerex Model 240 extinguishers are sold empty only. They are not charged or pressurized with any agent or water. Have an authorized service center fill with water and pressurize the unit for you or follow our recharging instructions. You can charge the extinguisher with water alone or with 10% FireAde 2000.